I'm in Portland, Oregon this week, and have been taking tons of notes while I'm here. In the meantime, here's a quick video of a Portland LRT vehicle. It is so transformation, clean, green, quiet and a beauty to ride. Here is some more information on this video, including my main findings. A ton of transportation-oriented development (TOD) along the route. I'm amazed at all the cool selection of lofts and condos along the LRT lines. The original line went right through Portland's oldest neighbourhoods from downtown to the east. That area which once was less than desirable to live has now become hugely popular. I've posted a new blog entry with some pics from northeast Portland. 20 years ago, this area wasn't really a place tourists would hang out. Ditto for southeast. Now they are among my favourite neighbourhoods. Clean, green at street level. These are electric trains with no diesel or gas engines and no exhaust at the tailpipe. I find riding LRT much more enjoyable than both buses and subways. Great scenery, lots of space, and a smooth, comfortable, quiet ride. I've been really impressed to read about urban neighbourhoods and business assocations 'fighting' over who will get the streetcars next. When Hamilton's mayor or a radio talk show says there's no desire for developers to build through Hamilton's B-Line corridor, they miss the point in a huge way. Developers will build where higher order rail transit links to 20,000+ downtown jobs and thousands more at MIP and Mac. We can see the same transformation of downtown and the central/east end that Portland has seen if we invest in the quality of life and new, convenient transit system. New urban infill doesn't have to be mega towers everywhere. It can fit a streetscape and bring new vibrancy to old retail streets combined with the relaxed zoning and neighbourhood developments I write about here. A belated happy birthday to MAX (turned 26 on September 5). get that clunky old streetcar out of my way - i'm a motorist! "It is so transformational, clean, green, --quiet-- and a beauty to ride." Quiet?? Jason, is the noise level which is clearly heard on your video for real? How does such disturbing noise levels translate to a "quiet" urban living experience?? especially on narrow width stretches like downtown King Street in Hamilton where there are apartments/lofts on either side of the street from 2nd floor up, or Main/King Streets, where there are homes on either sides of the road? Also, the LRT cars in Portland look so over-sized for the streets! Does it feel like that only on the videos? FYI, I was downtown today and had 6 or 7 trains go by...all of them much quieter than this video above. Perhaps it is one of the oldest in the fleet? Still, quieter than a bus. How so? A brief search on the web shows that Portland gets its power from coal and natural gas plants, as well as hydroelectric (the last one being the only real 'clean' source). and a beauty to ride. The only one I can't confirm but it would probably be just like every other mass-transit option: great when it's not busy, awful when it is. I'll take the sound of LRT over the roar of traffic on Main St any day. Mahesh, you'd be shocked at how much quieter that LRT was than Hamilton's buses. It's one of the reasons I wanted to grab this video. And this was one of the old model trains that Portland had when I lived here in the 90's. I also took a short video of one of the new Bombardier models that came by a few minutes later and it was darn near silent. Stand right at the curb sometime and film a bus leaving a station. You'll realize the difference. Thanks for the clarification Jason, I am sure the new systems would be much more quieter and smaller in scale. And thanks for all the pictures - sure is an inspiration for local architects and developers! 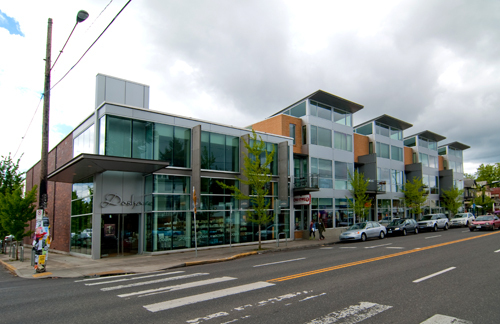 We could most definitely learn from Portland's design sense at every level - and hopefully the new infill development planning in Hamilton takes its cues from such examples you are sending down. Although, the latest news of Barbara Hall's escapade with human rights and zoning hangs like a dark cloud over Hamilton, and may well gut all the dreams and aspirations we may have for a meaningful redevelopment of Hamilton's lower city. Thx Mahesh...I leave in the morning so any further research will be online. But, boy, I am coming home with some very simple and clear goals to pass onto council and staff. Especially with regards to complete streets being a goal, more than 2-way, and the neighbourhood greenways as I mention in the other blog entry from today. What a small, simple and cheap way to transform urban residential streets. Another feature I've seen everywhere on the greenways and read about is the planter boxes in the sidewalks. You'll see some of them in the pics in my other blog entry. These are used for creating visual elements close to the street at corners to help everyone slow down, but they are also used to divert storm water run off. I saw a close-up of some today and they have small culverts that lead into the boxes from the sidewalks. The native grasses, trees and plants bring more greenery to a street but their highest function in my mind is sparing an overtaxed storm water system (Hamilton knows all about this) by diverting water into these huge sidewalk planters and into the soil. Simple, yet brilliantly cheap solution to a maxed out storm water system. I'll be blogging on this next week. you'll notice the metal grid layed into the sidewalk below this genteman's left foot. Cannon doesn't need all that concrete. Even as a 4-lane freeway, for most of it's length it has ample sidewalk space to spare the space next to the roadway for green infrastructure like I've shown above. We divert rainwater, green an urban street and once we add bike lanes to one side and 24-hour curb parking to the other, we can create bumpouts so that even as a one-way street, it now flows nicely with 2 car lanes, yet pedestrians and cyclists will actually enjoy being on it too. Imagine, wanting to walk or cycle on Cannon?? I've never been to Portland. I understand most of the downtown streets are one-way, but they're still slow because there's an intersection every 10 feet. wow! thx, these are great examples... and a noteworthy cause to focus on. 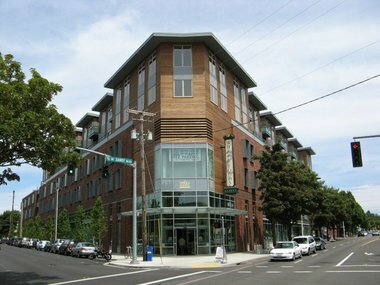 Also, besides passing on these examples to council and staff maybe it is time to start direct 'design info sessions' with all the property owners on Cannon between James and Wellington - to showcase such images/videos/examples (sort of a 'Portland streets workshop for Cannon' - in partnership with the Beasely neighbourhood assoc, the local architect firm which has an office building on cannon, and city design staff). If one is able to get the property owners on Cannon motivated to generate the need/demand/buzz at the council hall for such fantastic street design features, things could get done in a shorter time frame.